In Skopje,the NATO invitation was celebrated in the City Park.. The celebration was started by the group Quepurdat, and will be performed by Kiril Dzajkovski and Arhangel. White balloons and flags were distributed to the participants with the inscription "Going forward, Macedonia in NATO and the EU". 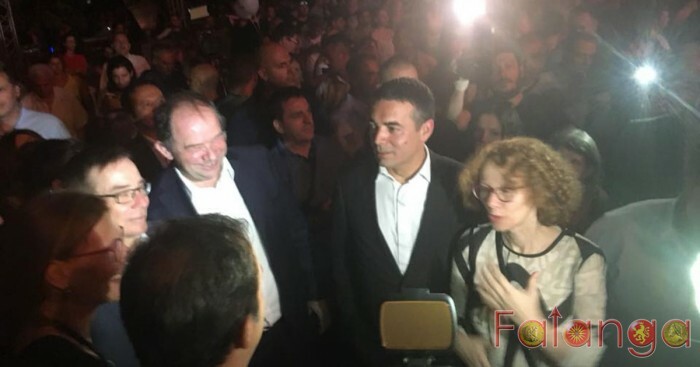 Deputy Prime Minister and Minister of Defense Radmila Sekerinska, Minister of Foreign Affairs Nikola Dimitrov, representatives of the diplomatic corps celebrated with the citizens of Skopje. - For many years we had feelings that we miss every chance and that bad things happen to the state and to the citizens. We've all had enough of bad news about traumatic experiences. Let's say that when we are together, when we know what we want, we really can raise mountains. The feeling of all today in different cities around Macedonia is exactly that, we want good news and we want results. Together we can achieve them - Shekerinska said. She expects all things to be done as Macedonia needs to become a NATO member country next year. "If we do not waste time, if we do not give politicians the chance to bring us political decisions, then the chances are that Macedonia will become a NATO member country next year," Sekerinska said. For Minister Dimitrov, we have a great historical year with large crossroads. - We waited a lot. Since 1993 we want to join NATO, 25 years have passed, 10 years after we failed in Bucharest. We have a great historical year in front of us with large crossroads. We managed the questionnaires about who we are if we are Macedonians, whether we are talking Macedonian language to close them. They are. And we managed to build friendship with three countries with which we have a delicate relationship historically. From tensions we have made friendship and friendship, and thanks to that the roads for NATO are opening up and we have a great promise for the June 2019 for the EU - said Dimitrov.